If I had to use only one word for Songs From The Land Of Nod it would be vague. Why? It is as if Beechwood does almost nothing of a lot. The mystery is that it seems to work. Without excelling in anything the trio presents a fine album that explores 60s garage rock and Jesus and Mary Chain fuzz. All with a lightness that suggest the music to disappear in vapours given half the chance. Not to mention the 70s disco clothes the band members are wearing in the cover photo. There is one thing concrete on Songs From The Land Of Nob. It contains the song that made me realise that a B side of a 45 single can be something special as well. Not straight away when my neighbour and friend Hans gave me his copy of 'Sunny Afternoon' (or sold. I can't remember whether it was 'Street Fighting Man' I got or 'Sunny Afternoon' all those years ago.) On the B side there's a song called 'I'm Not Like Anybody Else'. It took me years to appreciate it like I do up till today. And there it is in the middle of this album. This is Beechwood's its second album after the self-released 'Trash Glamour' (2014). The band is from NYC in the USA and fans of the NYC punk bands that came up in the second half of the 70s. Not that their music is punk in that sense. It is about the attitude, or so they say. Gordon Lawrence (guitar) and ISA Tineo (drums), accompanied by a, to me unknown, bass player, do not play punk. For that the songs are too melodic and, well, too 60s. What is totally missing is the psychedelic vibe that most bands have these days that are into the 60s. Beechwood is more into the 'Nuggets' side of the 60s. Yet, all is easily floating away, like driftwood, so psychedelia does come to mind before everything is sung and done. Just not in that obvious way of Hammond organs and the musical equivalents of fluid projections on a wall. And the band members' dress is so totally 70s looking it just confuses me a bit more. Despite the fact that all is sort of vague. The band very often simply does the right thing. Within the songs there are different melodies played by overdubbed guitars and a strong, often fuzzed up bass. The vocals remind me of Love regularly, which is a nice thing actually. The shouts in 'Melting All Over You' remind me of 'Dracula', the ZZ & the Maskers song from of 1964, while the song starts with a chord progression emulating Frijid Pink's rendition of 'House Of The Rising Sun'. So the vampire connotation in the bio accompanying the album rings true after all. The land of Nod is a place for wanderers in exile. It lies east of Eden (John Steinbeck anyone?) and Cain went there to live after he killed his brother Abel out of jealousy. And here we have the songs from that land. If this is the music they play there, it may be the right time to visit. In a song like 'All For Naught' things get to vague as far as I'm concerned. This is made up immediately in 'Land Of Nod'. 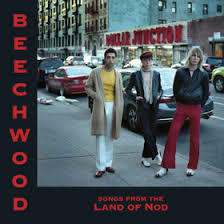 The opening riff is lifted directly from Zappa's 'Trouble Every Day' and incorporated in a totally different song, showing Beechwood could play a show with The Black Angels after all. In the end the band is a little of everything and nothing as a whole. Impossible to pin down. That, again, is one of the attractive sides of this band. It may be vague, but it certainly is nice to listen to every once in a while. Songs From The Land Of Nod are songs from a place of exile. No 10.000s of people are going to listen to this, but those that do will return to it again and again.